This month seems to be quite a busy month for the local automotive companies as following the upgrades to the Grand Livina from Edaran Tan Chong Motors and the new Perodua Myvi, Naza Kia too has launched the all new SUV, Kia Sportage. It is priced at RM138,888 on the road with insurance and this time they seemed to have gotten the design right. Kia has put out a braver front with this one where the design language is more fluidic and smooth. The previous model had a face lift in April but it is this one which is the real deal. It now comes with 18 inch alloy wheels wrapped by 235/55 tyres, the SUV has a more matured and modern look. It is powered up by a 2.0 liter Theta II engine paired with a 6 speed automatic transmission gearbox with Continuous Variable Valve Timing (CVVT). This gets you up to 163 horses where the engine also comes with the Variable Intake System. The car is moved through its All-Wheel Drive system while it is also equipped with full leather seats, a dual zone temperature air-conditioner as well as a leather wrapped steering wheel and shift knob too. Entertainment comes in a 6 CD changed powered through a 7 speaker system around the car. 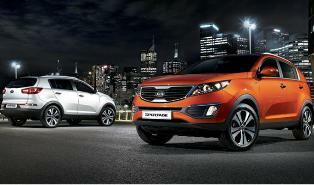 With 5 colours to choose from, the new Sportage could well be a runaway success.